Knowledge is power. Why not take control of your home’s electricity usage with a home energy monitor? Canstar Blue reviews home energy monitors and offers the following guide. We all know we can reduce our power bills by switching off lights and standby appliances, but you’re sort of flying blind unless you know when or where the power going to waste. Home energy monitors provide useful insights to help bill-payers identify opportunities to reduce their electricity usage. Energy monitors are also relatively simple to understand and more affordable than you might expect. In this guide, we discuss different types of energy monitors, how much they cost and what they do. What can Energy Monitors do? Electricity monitors provide real time and historic electricity usage information, helping users identify when and how they’re using power. Particular up-market models can even analysis usage patterns to detect which appliances in particular are putting a strain on your energy bill. 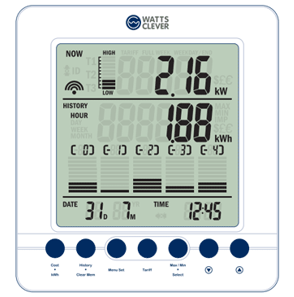 Most monitors with your tariff information can also calculate how much your electricity usage is costing you and can warn you if you’ve exceed a pre-set usage level. Some models can also be programmed to warn customers on a time of use tariff when electricity is most expensive. 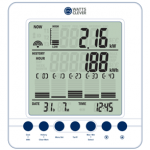 There are a few different types of energy monitors designed to suit different meter types and budgets. Monitors can be entirely online, or wirelessly displayed on a portable screen you can place anywhere in your home. If you have a smart meter, you can get set up with energy monitoring in minutes, but if you have a traditional meter, you may need to organise an electrician to install any necessary sensors. Wireless electricity meters are portable tablet-like devices about the size of your palm. These monitors display real time energy usage data, including kWh usage, costs and even Co2 emissions. Wireless electricity monitors are easy to set up and use, they’re usually wall-mountable and they generally have a battery life of 6 to 18 months. The downside to these models is that only some of the more expensive energy monitors display historical usage information, and if they do, it’s usually only for 12 months. So while a wireless energy monitor is handy for anyone wanting a general idea of their energy usage, any number-loving bill-payers wanting to track their historical usage and compare it to their neighbours will probably prefer an online monitor. Wireless energy monitors are available with both traditional and smart meters. Regardless of the meter type, you will require a qualified electrician to attach wireless energy sensors to your meter. As the name suggests, online energy monitors are completely web-based and can be accessed from a desktop or through tablet and mobile apps. Online monitors are typically more accurate than wireless monitors and generally provide deeper insights into your electricity usage, including information on voltage, power factor and how your energy usage compares to other properties in your area for that time of year. Online monitors can also track solar output provided you have the right solar inverter and meter. If you have a traditional meter, you can access online energy monitoring by adding an attachment to your internet router and hiring an electrician to attach a sensor to your meter. 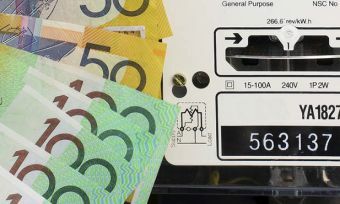 Most Australians with smart meters will automatically have access to online monitoring through their electricity retailer. You can see some of the retailers offering online account monitoring here. Retailer monitoring portals are particularly useful as they usually include bill predictions to help you budget. Solar monitors can track solar output, efficiency and savings. Solar monitors are usually incorporated into online energy monitors, provided that you have a compatible inverter and meter. Certain wireless monitors may also include solar tracking, though they often provide limited insights. When shopping for an energy monitor, you may see the term ‘3-phase’ thrown around. But what does it mean? Well for most homes, electricity is fed through a single wire, known as ‘single-phase’. If you have a large home with high-powered appliances, such as ducted air conditioning, then your home demands more electricity at certain times, which requires a higher current, fed through 3 wires – hence, 3-phase. This type of monitoring is virtually identical to single-phase energy monitoring, though installing any necessary hardware for 3-phase models is more difficult and expensive compared with single-phase monitors. There are plenty of home energy monitors on offer in Australia. Here are some of the most popular, excluding electricity retailers with online monitoring. Keep in mind that certain monitors have very particular compatibility requirements. Be sure to get an expert opinion if you’re not sure whether your home meets the requirements for energy monitoring. Energy monitors can cost anything from $15 to $400. Primitive and comparatively inaccurate wireless energy monitors are on the more affordable end of the scale. Traditional meter owners who require an electrician to install sensors for online or wireless monitoring suites will find themselves spending the most for electricity monitoring. If you already have a smart meter installed, you should be able to access online monitoring for no upfront cost. By entering your email address you will be subscribed to Canstar Blue’s Energy Newsletter and will receive updates on pricing and new deals. Should I buy an Energy Monitor? Of course, knowing is only half the battle. Even with energy monitoring, you may be paying too much for power if you haven’t shopped around recently for the best price. You can compare electricity companies and plans across Vic, NSW, QLD and SA via the link below.